Antigua is an increasingly popular cruise destination. While it is cruise visitor-friendly it is not as commercially developed as ports such as St. Maarten or St. Thomas and retains much of its Caribbean atmosphere. Part of the independent nation of Antigua and Barbuda, Antigua is located in the Leeward Islands. Sister island Barbuda is about 30 miles due north. Due to Antigua's location, it is sometimes included on Eastern Caribbean cruise itineraries and sometimes on Southern Caribbean cruise itineraries. Antigua is volcanic in origin and has several steep mountains. 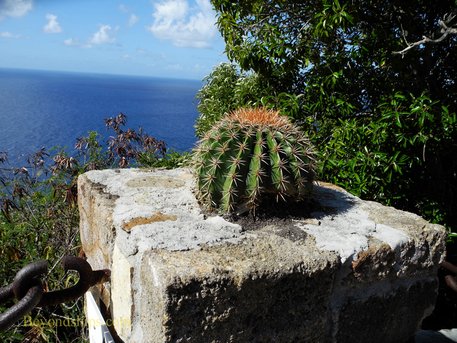 There is a rain forest in the high country but it is also not unusual to see cactus. The population of Antigua is about 85,000 with some 31,000 living in the capital city St. John's. English is the primary language. By the way, the locals pronounce the name of the island as "An-tee-ga". Tourism is the island's most important industry. In addition to cruise visitors, there are a number of resorts on Antigua. Yachting is also important to Antigua. The Falmouth/English Harbour area attracts legions of sailing yachts each year for Sailing Week, a world class regatta with social activities. 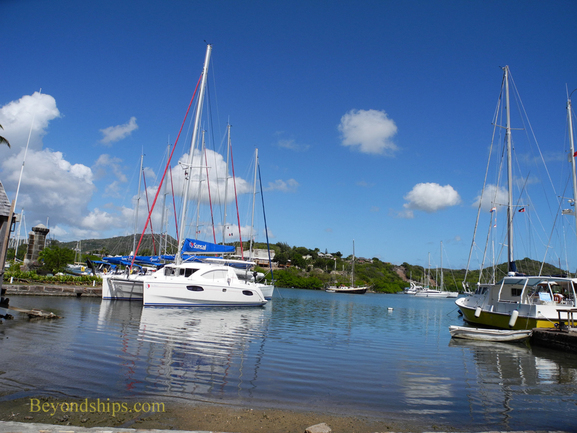 It takes place in late April but yachts can be seen in English Harbour throughout the winter months. Another important event in Antigua is the yearly carnival. This event celebrates the emancipation of the slaves in 1834 and includes costumes, parades and music. The official currency is the Eastern Caribbean dollar. However, U.S. dollars are accepted everywhere. Above: The government buildings are located on the outskirts of St. John's. 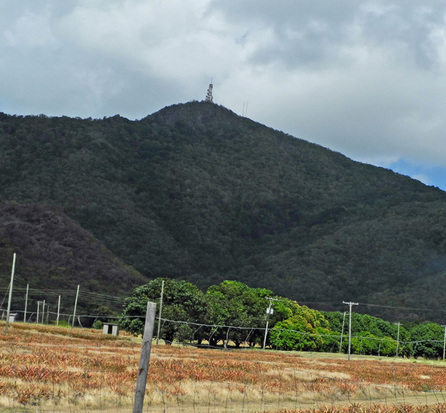 Above: The highest peak on Antigua is Mount Obama. Formerly known as Boggy Peak, it was renamed in 2009 in honor of United States President Barack Obama. 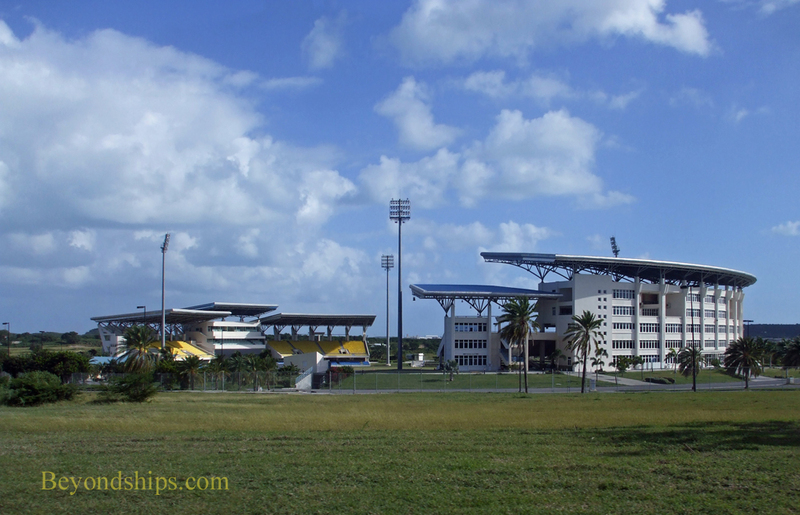 Below: The Sir Vivian Richards Stadium was built for the 2007 Cricket World Cup using a grant from the People's Republic of China. Cricket is a passion on Antigua. 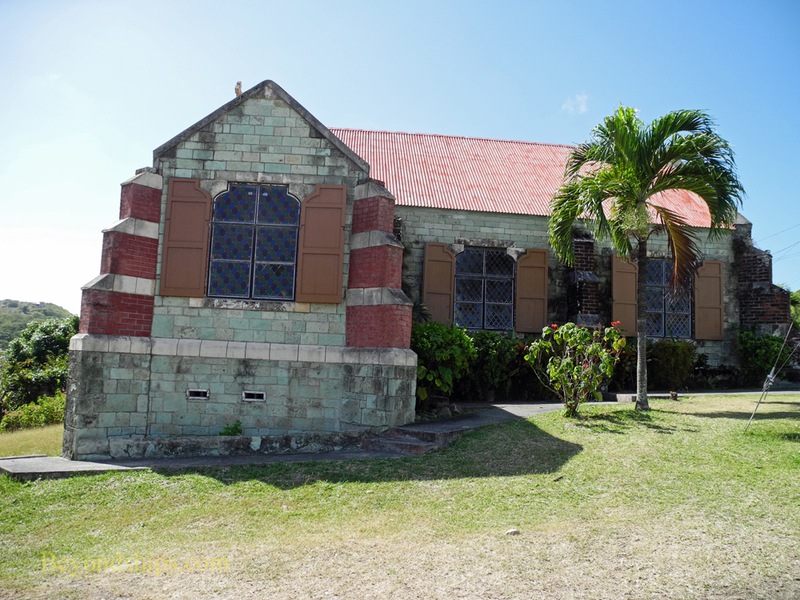 Above: The 250 year-old St. Barnabas Anglican Church is the oldest church in Antigua. It was built using bricks that were brought from England as ballast for sailing ships. Below: The ruins of sugar mills dot the countryside. Sugar was once the mainstay of the island's economy. 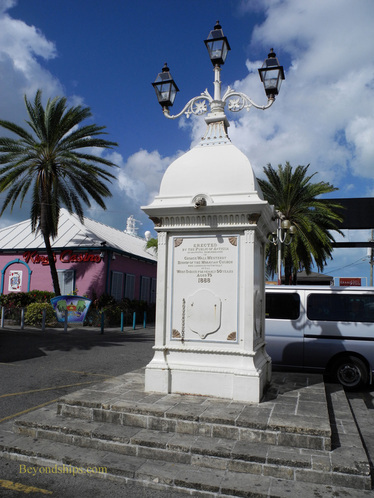 Above: A Victorian monument in St. John's. 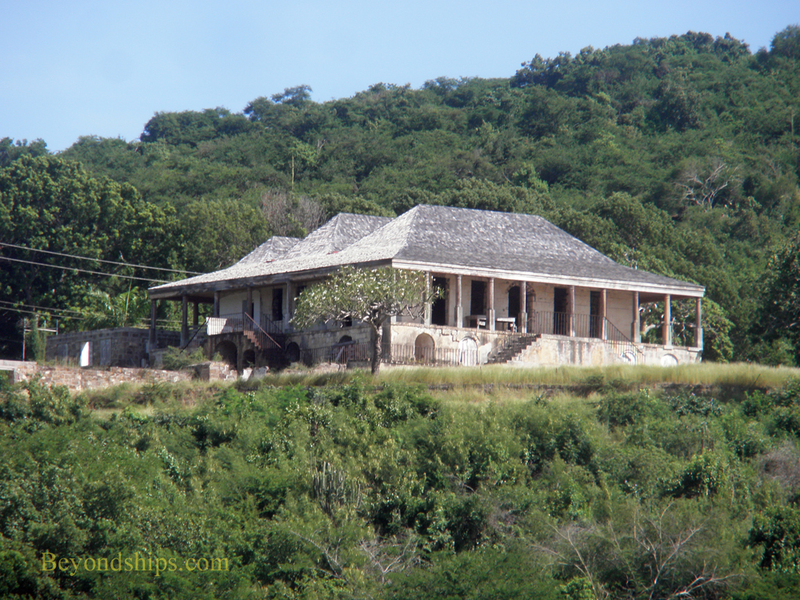 Below: Clarence House built for the island's governor overlooking English Harbour is currently being restored. People have been living on Antigua since 2400 B.C. These early people were followed by the Arawaks, who lived a peaceful, agricultural existence. They were ejected by the war-like Caribs in about 1100 A.D. Some 400 years later, the island was sighted by Christopher Columbus during his second voyage to the New World. Columbus did not stop but named the island after Santa Maria la Antigua. Due to the lack of fresh water on the island and fierce resistance by the Caribs, none of the European powers established a settlement on Antigua until 1632 when a group of Englishmen from St. Kitts established a settlement. A turning point for Antigua came in 1684 when Sir Christopher Coddington arrived on the island. 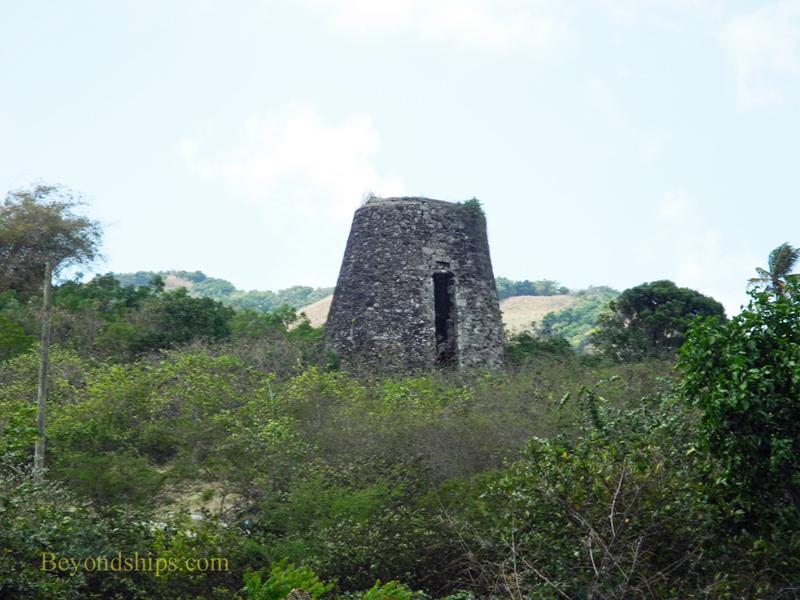 Coddington was interested in seeing whether sugar plantations could be established on a large scale in Antigua as they had been on some other Caribbean islands. 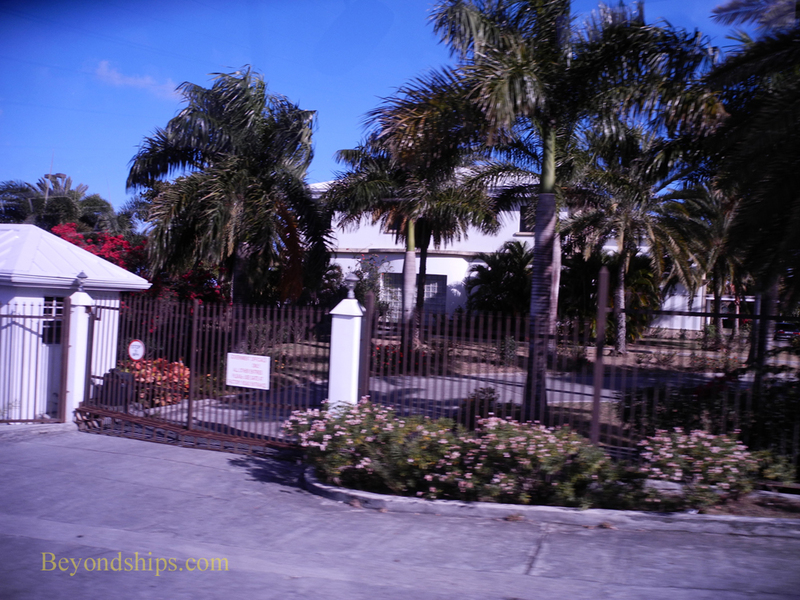 His plantation, Betty's Hope, proved successful and over the next 50 years the island was transformed into a sugar economy. Producing sugar from sugar cane was a labor-intensive enterprise. There is evidence that the planters first attempted to use Indians and white laborers for this work. However, they did not prove satisfactory and so thousands of captive Africans were imported to Antigua as slave labor. The conditions under which they lived and worked were often harsh and brutal. The European powers had been fighting over the riches of the Caribbean for many years. To gain a strategic advantage and to protect the lucrative sugar trade, the British established a naval base on Antigua in the early 18th century. (The remains of that base and its supporting fortifications are an important tourist attraction today. See separate page). By the early 19th century, public opinion in Britain had turned against slavery and in 1834, slaves were emancipated throughout the British Empire. This caused widespread rejoicing in Antigua still recalled in the yearly carnival celebrations. Without slave labor and with the rise of competition from the sugar beet, sugar cane plantations were no longer viable. As a result, Antigua's economy declined over the next century. In the 1940s, a labor movement led by V.C. Bird arose. This evolved into calls for self-government and independence. The first step toward independence came in 1961 when Antigua along with its dependencies of Barbuda and Redonda became an associated state within the British Commonwealth. In 1981, Antigua and Barbuda became fully independent. However, the nation remains part of the Commonwealth and so Her Majesty Queen Elizabeth II is head of state and officially Queen of Antigua and Barbuda. Most of the Queen's powers are exercised through an appointed governor-general. However, the islands have their own elected prime minister and parliament.